Rohit and Dhawan put up 154 runs for the opening wicket and in doing so they went past legendary duo Sachin Tendulkar and Virender Sehwag in an elite partnership list. The iconic pair of Sachin and Sourav Ganguly still holds the record for most century stands – 26. While, Rohit and present India captain Virat Kohli are at the second post with 15 hundred-run partnerships. Rohit hit the last ball off the 18th over, bowled by NZ pacer Lockie Ferguson, to complete the 100-run stand. It was Rohit and Dhawan’s 14th hundred-run stand in ODIs. In the process, the Mumbai batsman also completed his fifty. Later, Rohit (87) missed out on a chance to hit his first one-day hundred in New Zealand but India still managed a challenging 324 for 4 with all the batsmen coming good in the 2nd ODI. 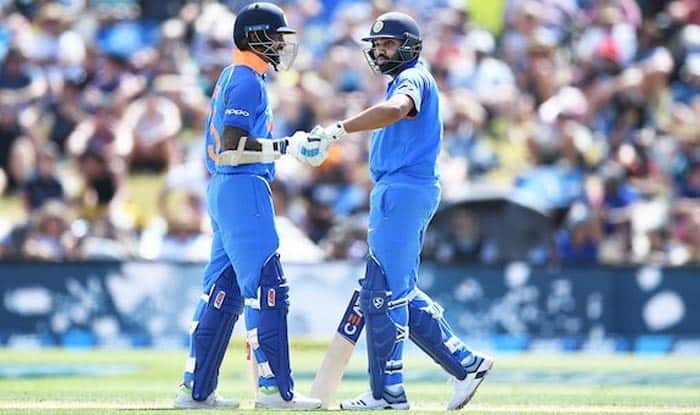 Dhawan (66) also struck a half-century while captain Kohli (43), Ambati Rayudu (47) and MS Dhoni (48 not out) chipped in with significant scores as the vaunted Indian batsmen dominated the home bowlers after the visitors opted to bat. Dhawan was the first to go as he reached out to a short and wide delivery from Trent Boult (2/61) only to thick-edged it to wicketkeeper Tom Latham in the 26th over. Dhawan, who set up India’s win in the first match with an unbeaten 75, had nine boundaries in his 67-ball innings.